Great Wolf Lodge is an incredible resort that my family and I have visited on multiple occasions. For the most part, I was a bit too young to remember everything about these trips. One thing I do remember is the Halloween dance party and being terrified to ride the Howlin’ Tornado. This past weekend, we got to revisit this fun, family-friendly resort yet again. 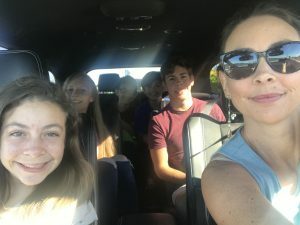 We packed our bags and grabbed a couple of friends, and began the drive to Great Wolf Lodge in Grand Mound, Washington. At the time of this trip, we were driving a very large Dodge Durango SRT. It was incredibly nice and spacious. There was plenty of room for the six of us that came along on the trip and our luggage. My mother found out very quickly the amount of power within the Durango. The car could go from zero to sixty in a matter of seconds, and there’s a special launch button that we never got the chance to test out. The drive took us nearly two hours, although it should have been less than an hour and a half. At the start of the drive, we immediately hit heavy traffic that kept us waiting around for quite a while. Everything turned out alright in the end, as we arrived at Great Wolf Lodge just around 5:30, giving us enough time to enjoy the evening. Great Wolf Lodge has a variety of different hotel room and suite designs. It is likely that you will find yourself the perfect, and most comfortable hotel room for you and your party with just a bit of digging. I believe most of the rooms stick with the theme of the resort that is woodsy/cabin-like, making for a fun and unique stay at this lovely resort. Eight people? I know it sounds ridiculous, but take into account that this is the Grand Bear Suite. I believe it is one of the larger rooms at Great Wolf Lodge, although there are a few others that are just as spacious, if not larger. The Grand Bear Suite has a king size bed, two queen size beds, and a couch that pulls out into a bed fit for two. Each of these beds could fit two people, therefore you could technically sleep eight people. If you want me to take it up a notch, I’ll say that the king size bed could probably fit three. Heck, throw someone in the bathtub for all I care. 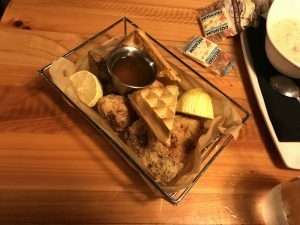 Great Wolf Lodge actually does care though and limits it to eight guests. Also, you have to pay extra if you bring more than six people. I’d say the only problem with fitting such a great number of people into this hotel room is the amount of clutter. This really depends on the person or group of people staying in the room, but I know that my family does a really spectacular job at throwing their belongings all over a nice neat hotel room. Within a few minutes of entering a hotel room, my family can make it appear as though we’ve been living there for months, although that is the opposite of the case. If you don’t have this problem, good for you. Considering the size of the hotel room, it does have two bathrooms. One of them has a bathtub, and both of them have a shower and a toilet. The bathrooms are fairly small, and a teensy bit cramped, but this isn’t out of the ordinary for most hotels. In general, the bathrooms weren’t bad. They’re bathrooms, after all. The provided amenities such as a hair dryer and other bathroom supplies are average, although I do have one complaint. As some places do, Great Wolf Lodge provided a conditioning shampoo, rather than a bottle of shampoo and a bottle of conditioner. Many of you probably know that conditioning shampoo is not for everyone. 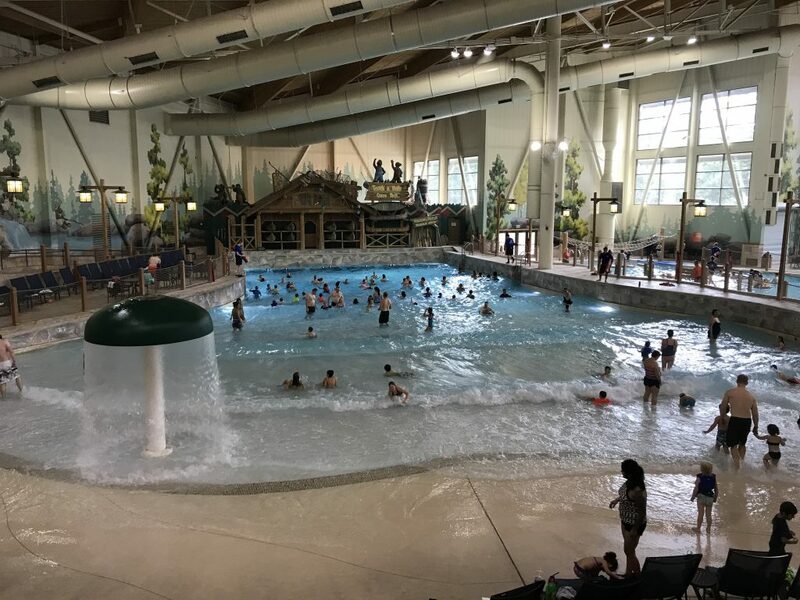 Also, it is more than likely that guests are going to need to properly wash their hair during a stay at Great Wolf Lodge due to a visit to the hot and humid water park. Overall, I very much enjoyed the Grand Bear Suite at Great Wolf Lodge. I shared the king size bed with one other person and slept like a baby, we had a balcony with a view of the ropes course and splash pad, and there was plenty of room for all six of us. After dropping our luggage off at the room, my family and I made our way down to dinner. That night we ate at the Lodge Wood Fired Grill, and we also had the opportunity to eat at Great Wolf Lodge’s other restaurants later in the trip. There were a few different places to eat, and I enjoyed all of the food that I ate over the weekend. I left every meal satisfied. Keep in mind that there are also a couple of different places you can go to get candy, ice cream, and other treats. The Lodge Wood Fired Grill had a pretty decent menu. Due to me not feeling so well (The cold has hit our area early this year), I ordered a mushroom risotto with a side of mac n’ cheese. The mushroom risotto was okay, and the mac n’ cheese was great. It was warm and cheesy, with bacon and a parmesan crust. You can also order mac n’ cheese as a meal rather than a small side. My family and I had ourselves a nice, friendly dinner, with plenty of tasty food. The Loose Moose is Great Wolf Lodge’s buffet. We ate there once for breakfast and once for dinner. 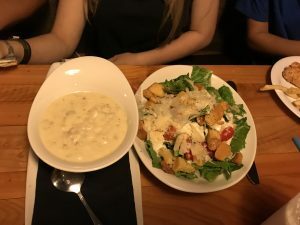 For both meals, there was an interesting variety of foods that all members of my family enjoyed. The breakfast buffet had some pretty standard breakfast options such as eggs, bacon, sausage, potatoes, and biscuits and gravy. Then there were the less average options, like fried rice and pizza. All of it looked good, although the special breakfast pizza with eggs and sausage looked a bit curious. At dinner time, the buffet was stocked with Chinese food, seafood, and good ol’ American food. Mom was very happy to be eating gigantic crab legs that night, and my brothers were equally happy to have the opportunity to stuff themselves with mashed potatoes and smiley face french fries. There was also plenty of dessert. I only took a few bites of the sweets here and there, but what I did eat was delicious. Buckets is located just inside the water park. It’s named after the large bucket on the play structure that dumps water every minute or so. This is where we decided to eat lunch before our water park fun. 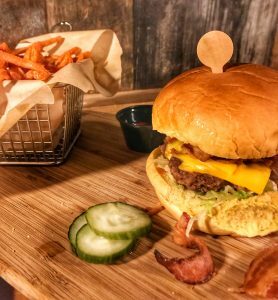 Buckets mainly serves up burgers and chicken tenders, and there are also a few salad options. We did not have to wait in line for long, and we ordered as quickly as possible. Unfortunately, it did take them quite a while to serve us our food. This left everyone a bit aggravated, but everyone soon forgot about the annoyance as they dug into their food. I ordered the chicken tenders with crinkle fries. Both foods were warm and crispy. I ate almost every last bite, but it was too much food to finish completely. I was very happy with my lunch and headed off to the hot tub after. Hungry As A Wolf is a small pizza place inside of Great Wolf Lodge that is located just outside of the water park. Although it did take a while for them to serve us our pizza, the pizza was pretty good. If I were to eat there again, I’d simply make sure to order a bit sooner so that we aren’t waiting for quite as long. 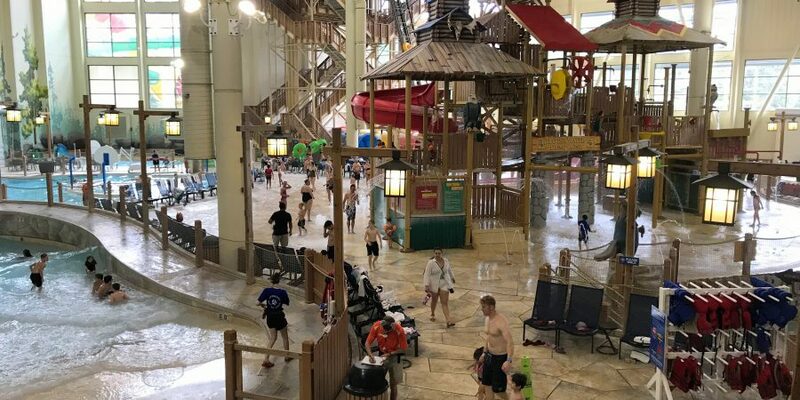 Great Wolf Lodge has an amazing indoor water park that is great fun for the whole family. I myself enjoyed all of the rides and each of the pools. My mother and I especially enjoyed the hot tub, as we particularly love basking in the warm water and doing absolutely nothing. There are multiple different water slides within the water park at Great Wolf Lodge. All of them are thrilling and fun, and the lines never got incredibly long while we were there. My family and I had a total blast, although we were sometimes unwilling to leave the warmth of the hot tub and hop into the slightly colder waters of the pools and water slides. The Great Wolf Lodge Howlin’ Tornado was hands down our favorite ride. Sliding into the darkness, you quickly arrive at a massive drop into a giant funnel. Although very bright inside the funnel during the day, the ride is even more thrilling at night. In the complete darkness, the slide before and behind you, including bumps and turns, is even more sudden and unexpected than during the day. The same can be said of the other large slide, River Canyon Run. Although not as intense as the Howlin’ Tornado, it’s still incredibly fun. The slide is lit with colorful lights at night, and employees told us of Christmas time, where they play holiday music inside the water slide. I’d love to experience this for myself. Someday, perhaps. Two more slides await guests at the Great Wolf Lodge resort, both of them smaller tube slides suited for one or two people. With these slides, you and your family have the opportunity to race each other to the bottom. The lines for these two slides is often much shorter than the line for Howlin’ Tornado and River Canyon Run, which are slightly more popular. Amidst the main play structure of the water park are two small body slides. Similar to the smaller tube slides, you can also race one another to the bottom. Just keep in mind that you will have to make it all the way up the slippery platforms of the structure to get to the body slides. The wave pool at Great Wolf Lodge is of decent size. It never got too crowded, although you must be careful of other people and children amidst the waves. You never know when you might knock into someone. A dip in the hot tub is in nice contrast to the coolness of the wave pool. There is only one hot tub, but it is fairly large and stretches into the outdoors. Our only problem with the hot tub was the amount of people in it. Sometimes the numbers were fine, only a couple of people and maybe their kids. At other times the hot tub was packed with people, adults, children in life jackets, and kids with goggles on. This made our hot tub experience slightly less enjoyable, but the younger kids allowed for a bit of entertainment. One of the younger boys, that must have been around nine years old, approached my brother and his friend while we were having a casual conversation. The boy very confidently told us what bad people we were for using words like “heck” and “frick.” I didn’t really know how to respond because I don’t think I’ve ever been told not to use those words in my life. There was another pool between the wave pool and the lines for the water slides. Basketball hoops and lily pads were the main attractions in this section of the park. My brother Jonah and his friends enjoyed running across the lily pads without the rope as fast as they could. I didn’t ever give them a try because I’ve never been good at those in the first place. 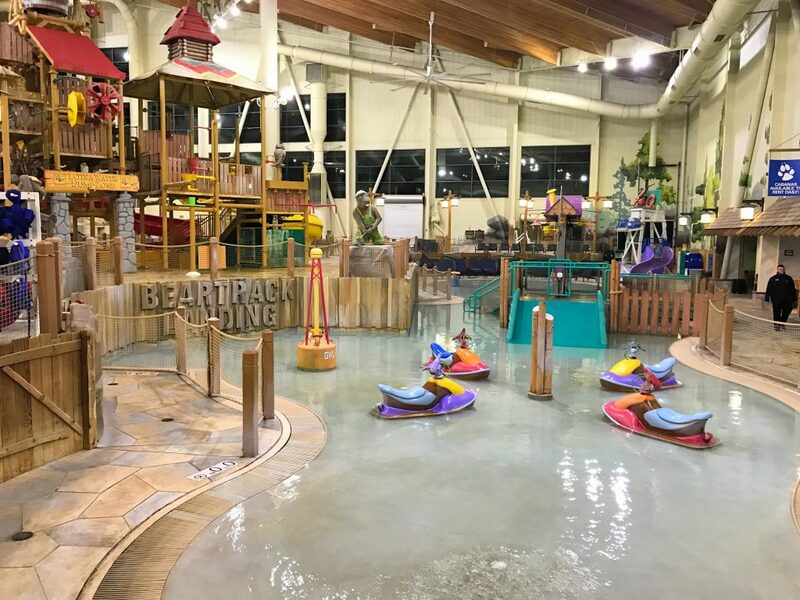 Great Wolf Lodge has an incredible number of activities that most of the family can happily partake in. There are so many different activities that we hardly had enough time for them all. 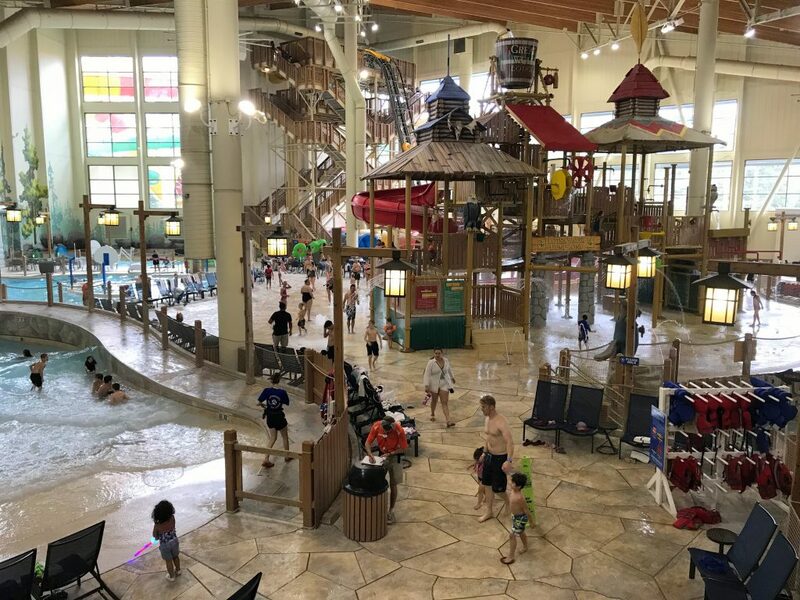 Between the water park and the activities, you’ll find your stay at Great Wolf Lodge chalked full of constant fun. 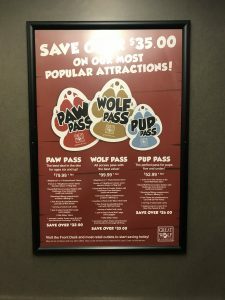 Each of the activities listed below can be found on Great Wolf Lodge’s activity passes, such as the Paw Pass, Pup Pass, and Wolf Pass. Head on down to the MagiQuest shop at Great Wolf Lodge. Purchase a wand, and get it set up at the counter. There are a variety of wands to choose from, as well as many different wand toppers that make your wand extra special. I chose the golden wand and adorned it with a majestic unicorn topper. My brothers’ wands looked equally amazing, and so were their MagiQuest usernames. Jonah, of course, went with the name Shrek. His friend decided to be Bob, and Noah was Dave. I thought about choosing the nickname Kevin to complete the trio of minions from the Despicable Me movies, but I went in a different direction with the elegant name Dr. Phil. When the process of getting our wands was complete, we roamed around Great Wolf Lodge, waving our wands at random objects. We never did get the chance to complete an actual quest, but this is because we were so busy with all of the activities at the resort. 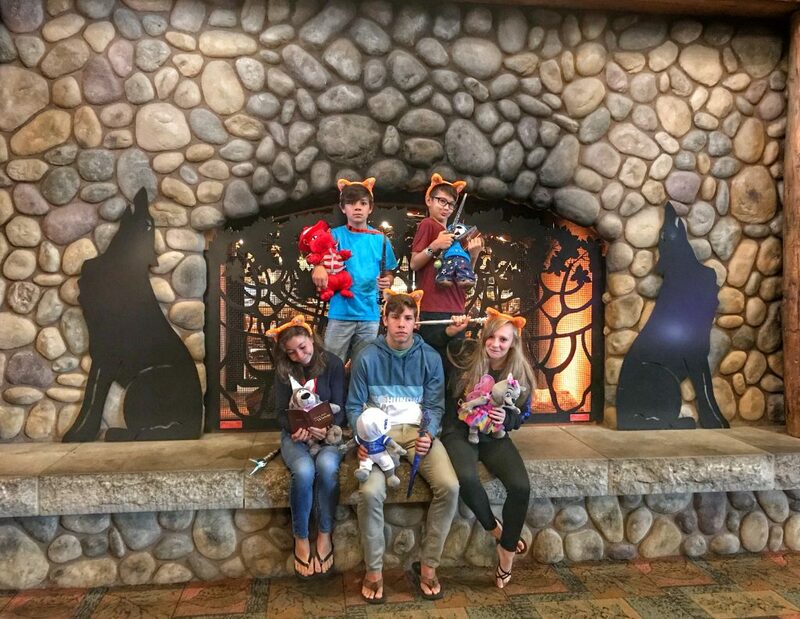 My family in front of the fireplace at Great Wolf Lodge; each of us holding wands and stuffed animals; each of us looking like total weirdos. After purchasing our wands, we headed up to the second floor. This is where you will find the Creation Station, right next to Hungry As A Wolf. The Creation Station is a place where you get to choose one of the six characters that represent Great Wolf Lodge. After choosing one, you have the option to stuff it yourself or let an employee stuff it. You can also pick out an outfit for your animal. It’s Great Wolf Lodge’s version of Build-A-Bear Workshop. 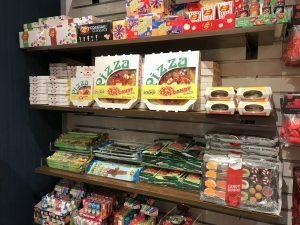 The employees said that they will actually be getting a Build-A-Bear workshop installed in place of the Creation Station. After stuffing your animal of choice, the employees asked if we wanted to play the scavenger hunt that was apparently included with the animal. Although we were pretty set on trying everything we could, the workers also said it was aimed more for younger kids, so we declined. Of course, if you have young children, I’m sure this would be yet another fun activity to partake in during your stay at the resort. Of course, we can’t forget about the ropes course. My whole family could see the ropes course from our windows and the balcony. Everybody was excited to climb the multiple stories and brave the course. All of us had been on a couple of courses similar to this one, although our friends had not. 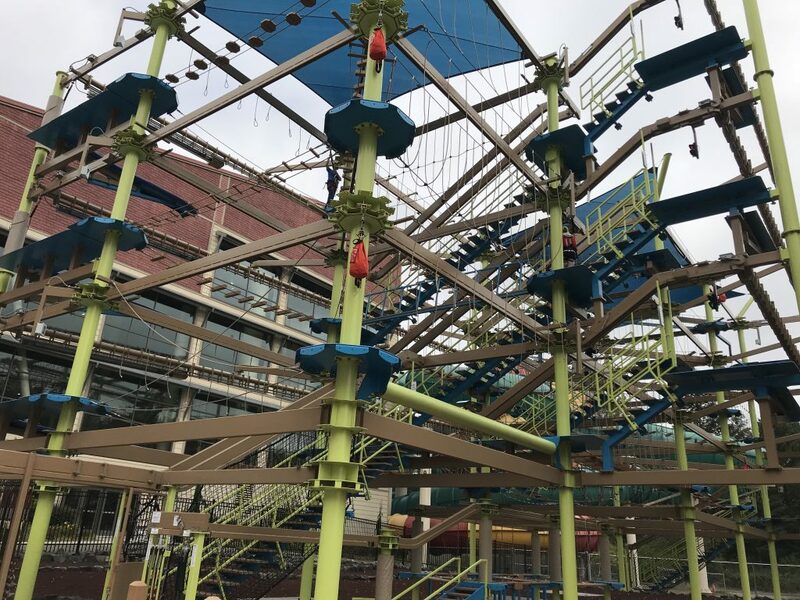 The ropes course at Great Wolf Lodge is multiple stories high, with several levels full of obstacles. Each of the levels has two zip lines, one on each side. My whole family agrees that the ziplines were the best part. The course held a good variety of different obstacles that weren’t too challenging, but good enough. I very much enjoyed the course, although I must say that you can only do one thing so many times before it starts to become a little bit boring. The ropes course was slightly less enjoyable this time, not because Great Wolf Lodge doesn’t have a good course, but because I’m a bit spoiled; this could also be tributed to me getting older. I’ve managed to outgrow these kinds of things, but not my stuffed animals. Great Wolf Lodge has both a mirror maze and small area where you can pan for moonstones. The story behind the mirror maze is that you’ve ventured into a dark mine in search of moonstones. I’ll say that these two activities were the only ones that I didn’t enjoy as much. The mirror maze was small and easy to complete. Panning for moonstones was uneventful, although I do have some colorful rocks to add to my collection. 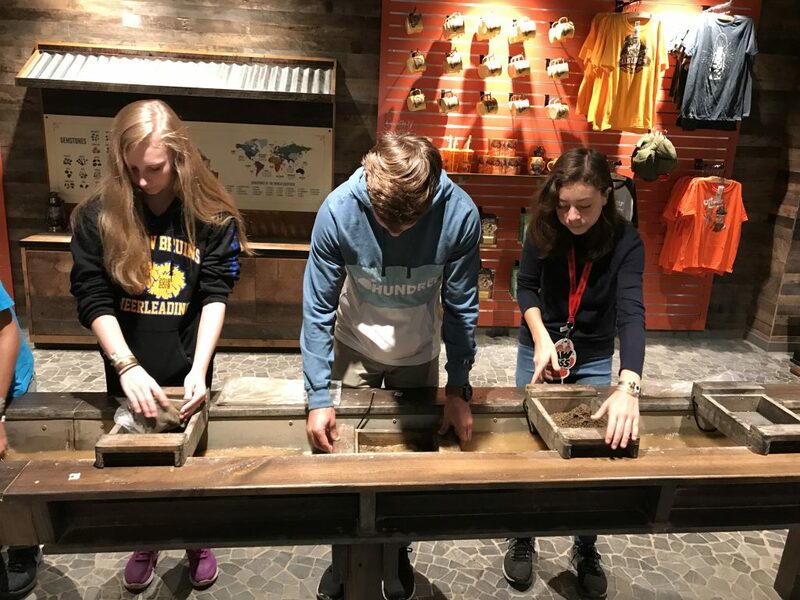 I must say, if all you’re getting out of this activity is a bag of rocks, then you definitely shouldn’t pay money for this activity individually. You can buy colorful rocks for cheap at the store if you’d like. This is the black light mini golf course located on level two of the resort. 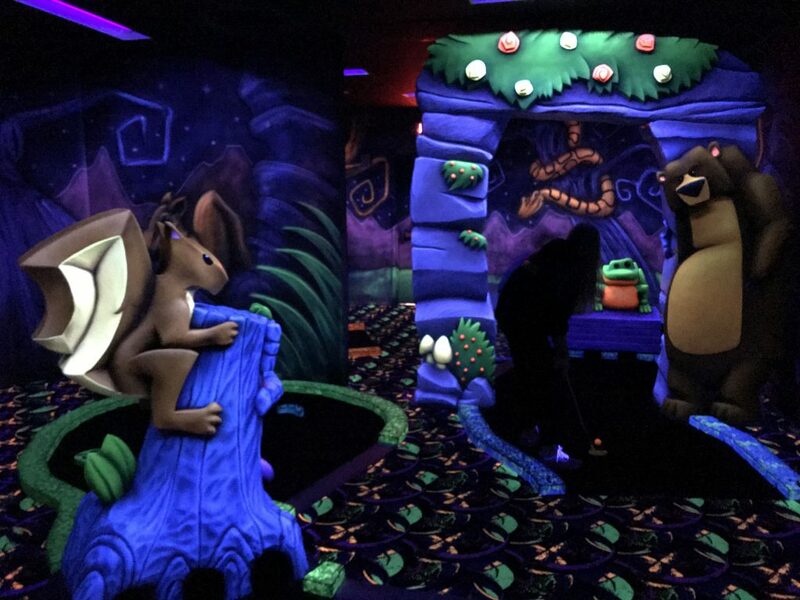 Some of the activity passes also give you a round of black light mini golf and twenty Paw Points to use in the arcade. The glow golf wasn’t half bad, although I will say that most of the games in the arcade cost nine Paw Points. Everybody ran out of credits pretty quickly. 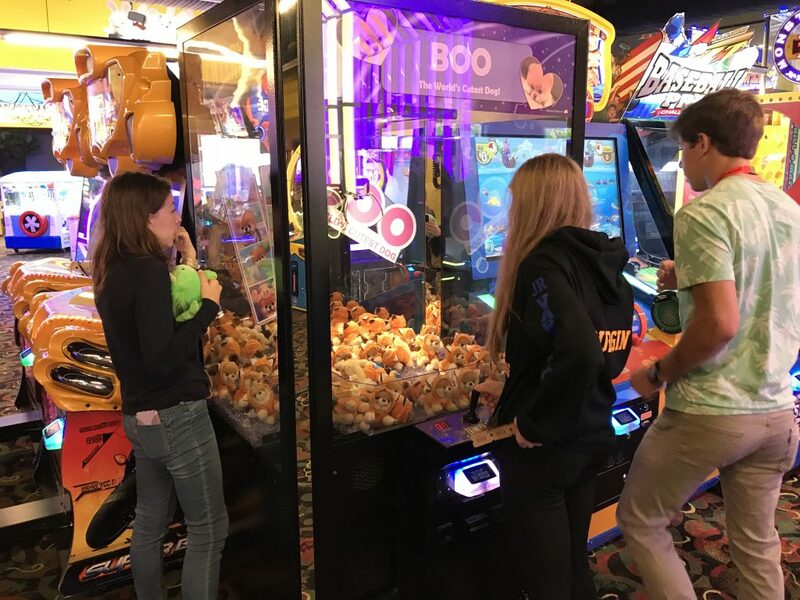 If you wanna have a good time at the arcade, bring extra money (if you got an activity pass with twenty Paw Points). The arcade was like any other. There were a few claw machines, several motorcycle racing games, and pretty much all of the other games you’d expect at an arcade. We hung around the Jumpin’ Jackpot for quite a while because Noah’s girlfriend had won the jackpot first try, and continued to play in an attempt to get it again. Unfortunately, that first jackpot was the only one she got, but that’s sure better than nothing. After a long weekend full of fun and adventure, it was time to suit up. As some of you may know, Halloween at Great Wolf Lodge is an event. Each of us got into our Halloween costumes in preparation for the costume dance party at nine o’ clock. My whole family looked insane, but that’s okay. I was a unicorn, Mom was a pirate, Noah was a priest, and Jonah was… I don’t really know. We arrived at the dance party looking good. My brother Jonah and his friend spent a lot of time dancing and creeping out the little kids. People gave our group a lot of strange looks, but let’s be honest; we were the life of the party. 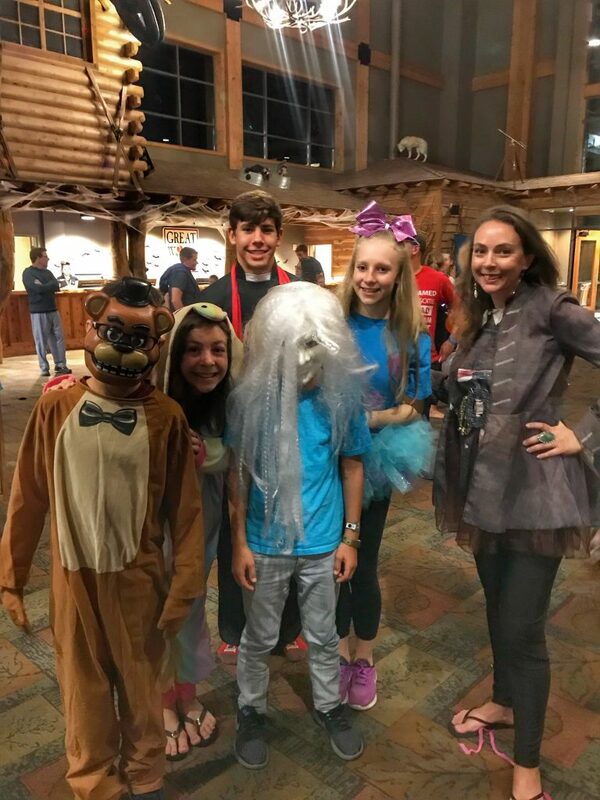 It truly was a Great Wolf Lodge Halloween, for us at least. To sum it up, my family had an absolute blast. 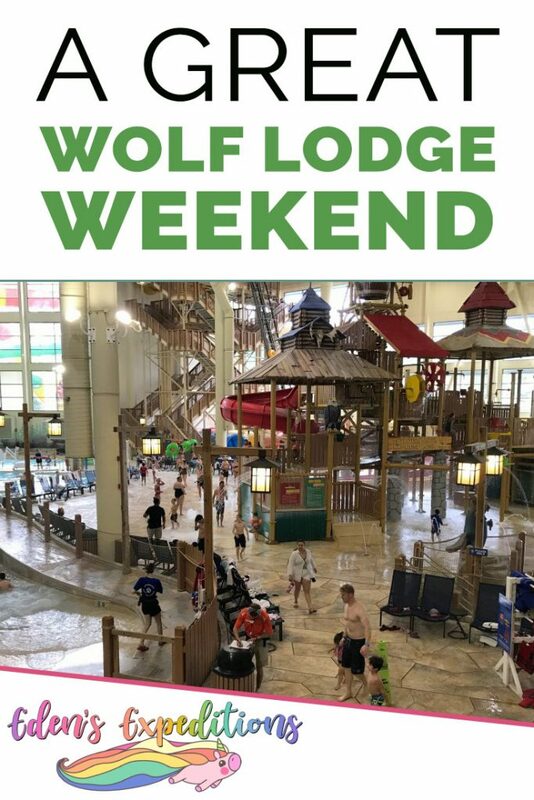 Great Wolf Lodge just has so many great activities to choose from for kids and parents of all ages. There’s no way we couldn’t have a good time. I’m so glad we had the opportunity to visit Great Wolf Lodge for the weekend, and my whole family hopes to return sometime very soon.